About 11 years ago now, one of my dearest writing friends, Lindsey O’Connor, gave birth to her fifth child, a little girl named Caroline. That happy moment suddenly gave way to a trauma that would leave Lindsey’s life hanging in the balance for many long weeks and months. She writes poignantly of that episode in her life, of what it was like to be “someplace other” and to try to make sense of it all once she woke up, in her brilliant memoir, The Long Awakening. Warning: do not start the book until you have time to read it all. It is impossible to put down once you begin. Here’s a story Lindsey shared in her book, a memory I still look back on, and marvel at. In fact, I went to Texas two weeks ago, drove past the little store mentioned here, smiled and gave thanks in remembrance. Near my daughter Allison’s birthday, my friend Becky had emailed Kathy asking for our home address so she could mail a birthday present she’d brought for Allison. Becky and I had started our friendship as writing and speaing colleagues and had grown into sister-friends, who knew and loved each other’s children, and she had wanted to get something special for Alli’s tenth birthday. She dropped in at The Mineola Mercantile, an East Texas boutique not far from where she lived, and told the owner what had happened to me and that I was lying in a coma missing my little girl’s birthday. She pulled out a silver charm bracelet and the three silver charms – one said “Big Sis,” another of a heart with “mother and daughter” written across the front of it, and finally a letter “A” with a guardian angel peeking through the “window” of the letter. The store owner said, “Now tell little Alli that charm represents her guardian angel that is always watching over her all of the time.” Becky went home, wrapped the present, wrote Kathy for the address, and only when Kathy replied did Becky discover a fact she had not know when she’d bought the gift. Add the blended tomato mixture to the pot, then add the 2 cans of beans, and the rest of the seasonings, tasting as you go to make it balanced as you like it. Adding more sweet, or heat, or salt until you just love it. You can top with sour cream or Greek yogurt, shredded cheese, jalapenos, diced avocado, green onions, chopped cilantro, crumbled tortilla chips… whatever you like. Always a hit with hot buttered corn muffins. People often ask me how I cook with Jackson around. 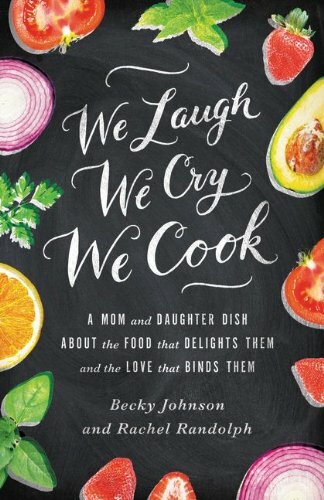 In We Laugh, We Cry, We Cook, I wrote about how cooking with him was kind of like cooking on an obstacle course. For a long time, that was what it felt like. But recently, I realized at this stage–the two’s–cooking with him is one of the easiest things on my to-do list to accomplish with him around. Not easy…but it’s something he’s come to feel at ease around. It’s kind of “our” thing. I left him with a friend the other day for a few minutes and when I returned she shared this little conversation they had. Sarah: Do you have a dog? Jackson: No, I have a mommy. Sarah: Oh, well that’s almost as good as a dog. Jackson: Yeth, I cook with mommy. Well, there you have it. Dogs don’t make very good cooking companions for kids, but mommies are very good for that. My other to-dos don’t have the same smiley affect on him. Writing with him around. Yeah right. Phone calls. Let’s just say, the last conference call I was on with our editor, I had to muffle the phone while I hollered, “Jackson, don’t stick your head through the fence” and then again while he hollered, “Noooooo! Don’t wipe meeee!” as I was trying to discreetly potty train mid-call. 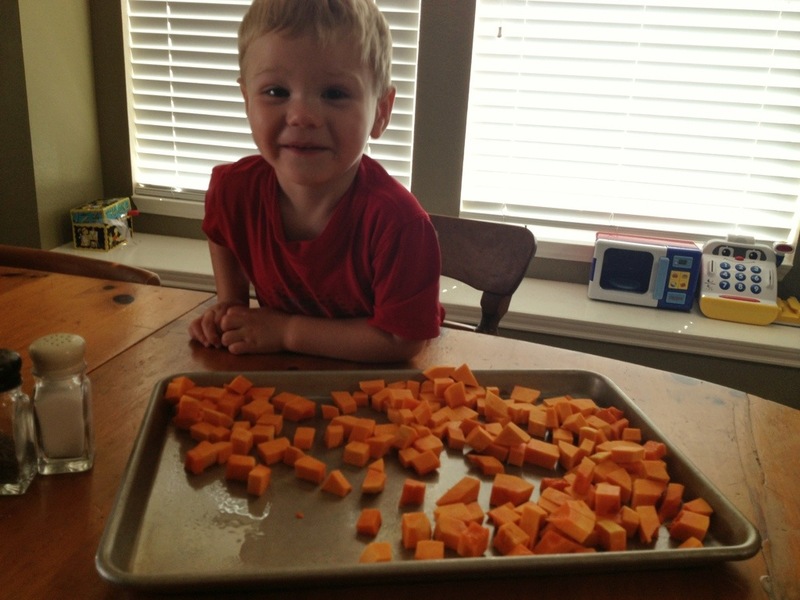 Cooking is mostly a piece of cake…because he can participate, he can be a helper. And even when he can’t help with something like chopping onions, he’s still content because we’re together and I’m talking to him, not somebody else on the phone or looking at a computer screen. 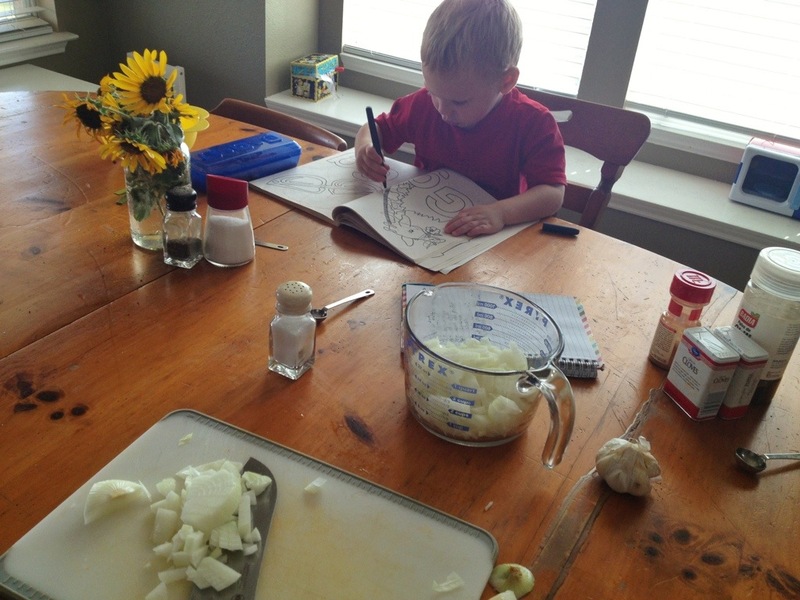 And with a little creativity, there’s almost always a way to get a child involved in the cooking if they want to be. I don’t cook every day, but the days I do, the moments we are in the kitchen together, are often the moments we enjoy the most. 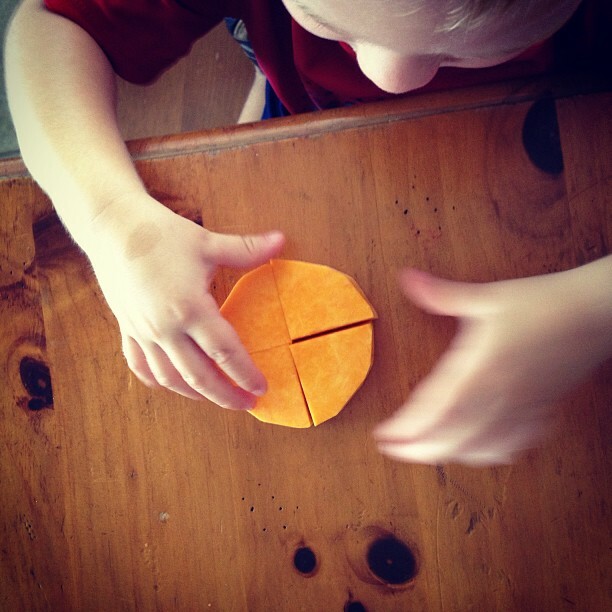 The kitchen is a place where our lives intersect, where my almost 30-year old female joys and interests cross with my two-year old little boy’s interests. I don’t have to pretend that the lego tower we just built is the tallest most amazing piece of architecture I’ve ever seen. He doesn’t have to be patient with me as I make a quick call or pick up groceries. The smells of cloves and cinnamon, the colorful block puzzle from butternut squash, the sound of the blender engine purring excite us both. We don’t have to pretend. We just have to be. Together. Preheat oven to 400. 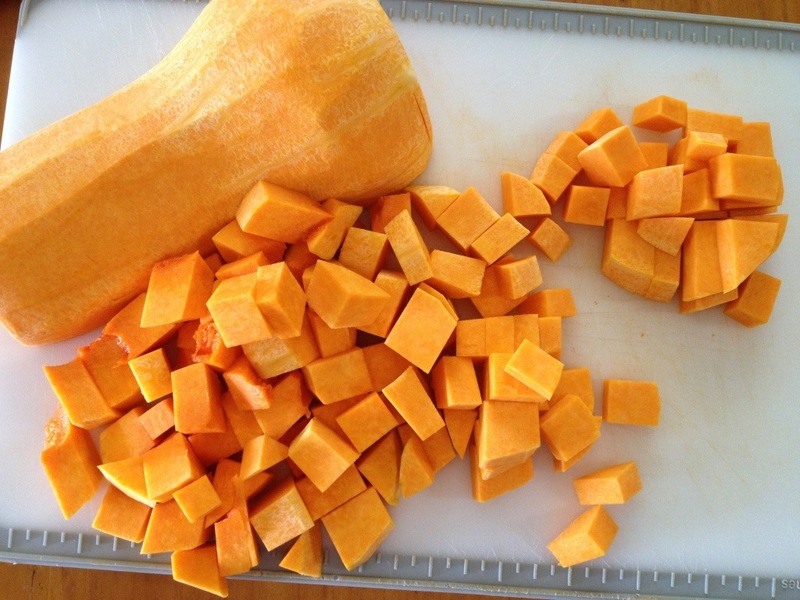 Toss butternut sqaush with canola oil, brown sugar, chili powder, and cinnamon. Bake at 400 for 20 minutes or until tender and cooked through. Resist temptation to eat all the squash now. Reduce oven temp to 350. Ladle 1/2 cup mole sauce into bottom of a 9×13 casserole dish. Wrap corn tortillas in a damp paper towel and heat in microwave for about 30 seconds, just enough to warm them up and make them pliable. 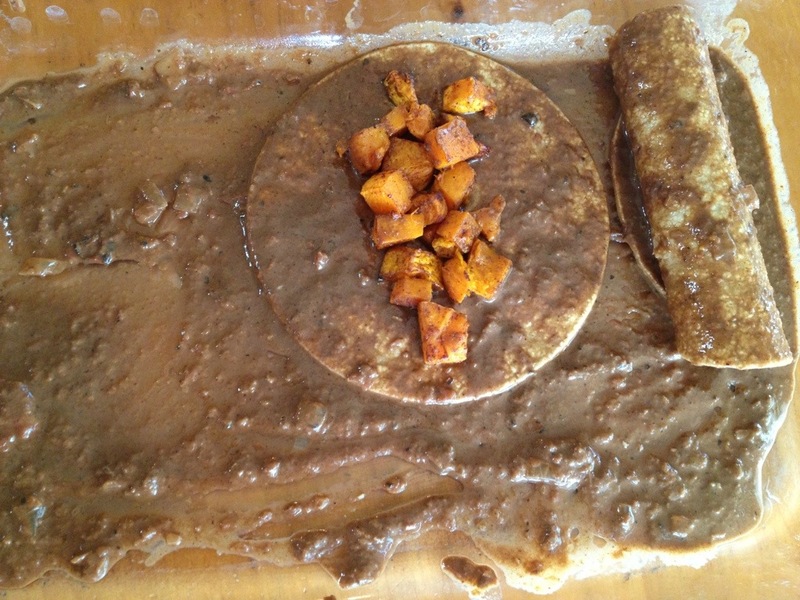 Dip corn tortilla into mole sauce. 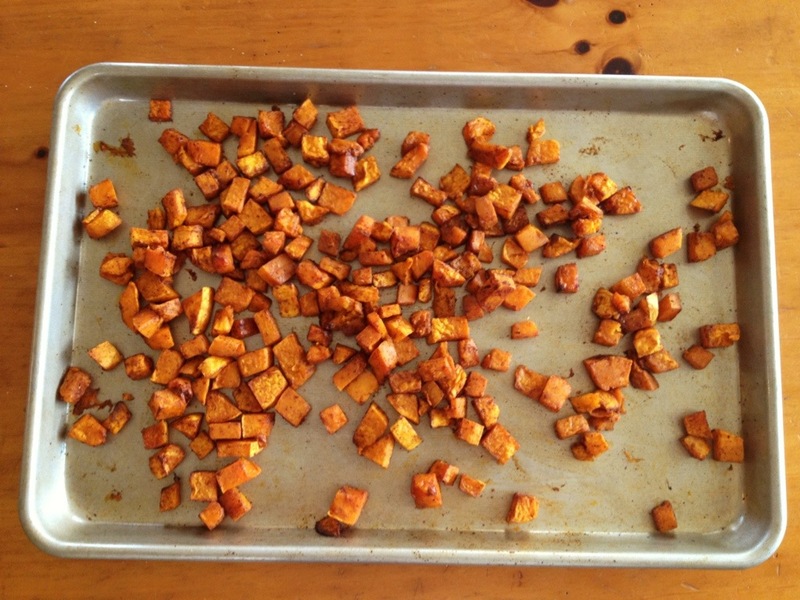 Fill with about two tablespoons of butternut squash and a sprinkle of raisins. Roll up. Repeat. Ladle a generous amount of sauce on top. Bake at 350 for 15 minutes. I didn’t put the raisins in when I took pictures, but I should have! I added them to the top and it really made the dish, so I incorporated them into the final recipe. Serve with black or wild rice. 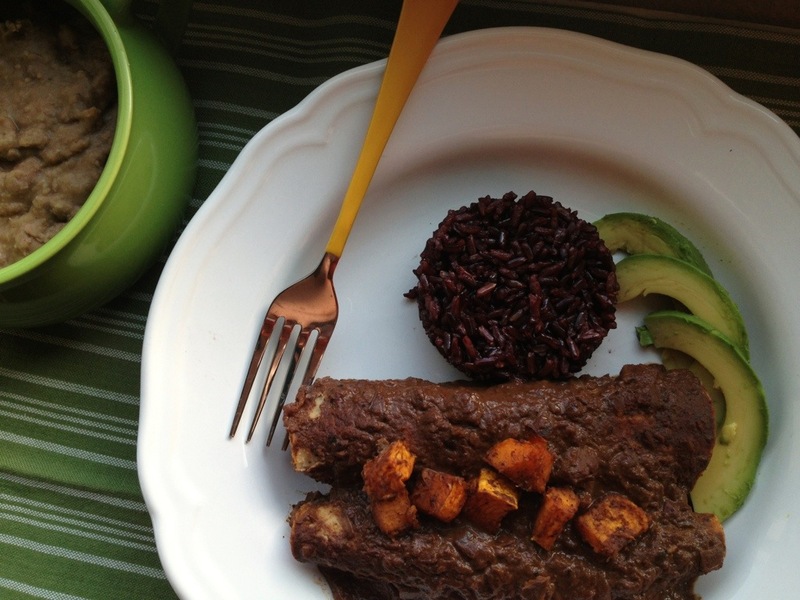 The nuttiness from the black rice went perfectly with this dish. *I blended half of the sauce this time. I think I’d leave it unblended next time though, because it was a lot prettier unblended. 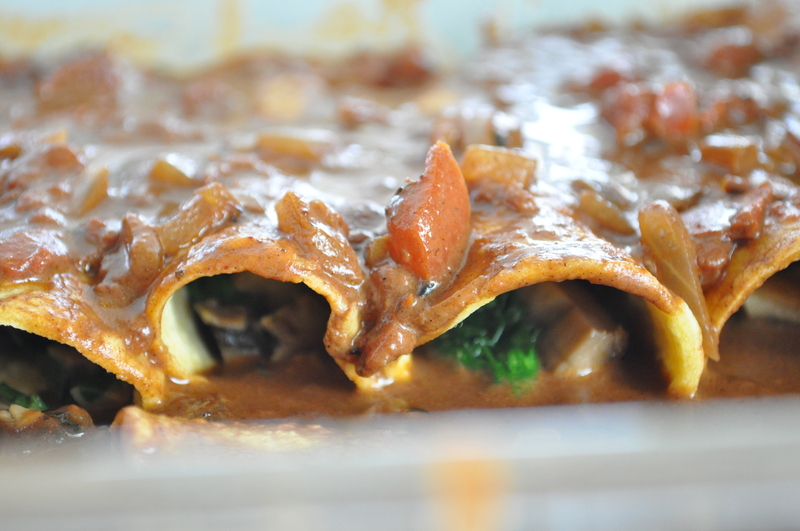 Same sauce unblended on spinach and mushroom enchiladas. Much much prettier, eh? About a month before I switched to a plant-based diet, I perfected the fried egg. I wasn’t much of a cook back then, so this was a big accomplishment and it quickly became my go-to breakfast. When we gave up eggs, I must admit, I was a little bummed that I only had a month to enjoy my perfected egg-frying skills. I’m over it now and I’ve learned some great ways to substitute eggs in my cooking: tofu scramble breakfast tacos and flax eggs and chia eggs for baking, but the fried egg seemed impossible to duplicate, until I got this idea to use a fried potato as the fluffy egg white and avocado as the creamy yolk. A “green egg” if you will. For those transitioning to a vegan diet and facing those early egg cravings or for those just looking for something different than the traditional egg breakfast, this potato and avocado “fried egg” is delicious. It’s really hard to go wrong with fried anything, right? I could see using this green egg for a vegan eggs Benedict too, stacked on an English muffin with a creamy vegan hollandaise. Try them! Try them! You will see. These green eggs are so easy. You can eat them in a box. You can eat them with a fox. You can make them for a friend, maybe during a relaxing weekend. You will like green eggs. You’ll see. Especially with tortillas, beans and ranchero sauce. Spicy! The creamy avocado “yolk” and soft fluffy potato round “whites” give the texture of a fried egg. 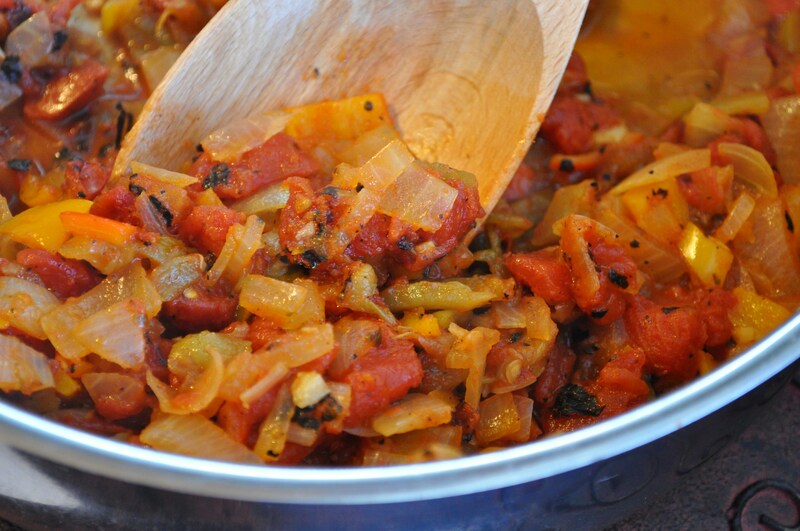 In a deep-sided skillet or medium sauce pan, saute onion, peppers, and garlic with a drizzle of olive oil and a pinch of salt on medium heat until soft. Add the tomatoes and green chilis and simmer for about 10 minutes. Transfer to blender (or use immersion blender) and blend until combined into a thick sauce, blend in salt and chipotle powder to taste. Transfer back to skillet and keep warm. Before blending the ranchero sauce. Look at all that flavor and color! In a separate skillet (iron skillet works well for this), heat a thin layer of olive oil on medium heat (about a 1/8 inch thick). * Add a single layer of potato rounds and pan fry for 2-3 minutes per side until golden on the outside and soft in the middle (think texture of a french fry.) 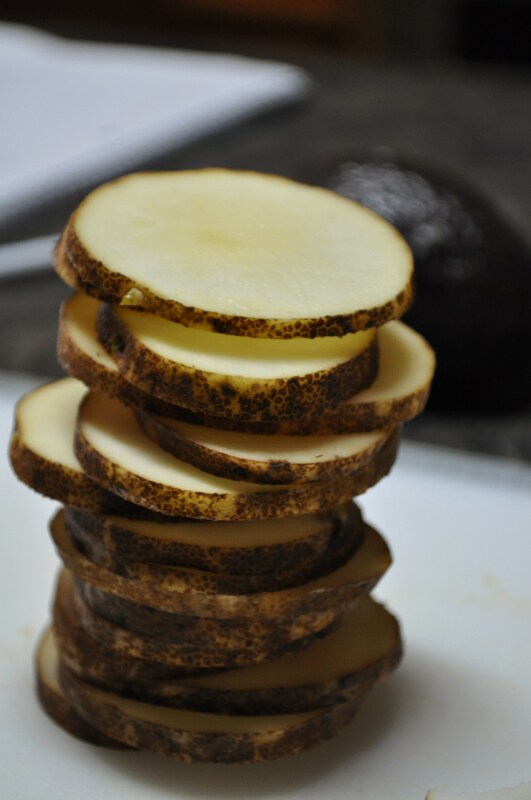 Transfer potatoes to a paper towel-lined plate and sprinkle with salt & pepper. Repeat, adding oil to pan as needed, until all the rounds are fried. Golden on the outside, soft on the inside. In the same pan used to fry potatoes, drain off excess oil and warm tortillas. 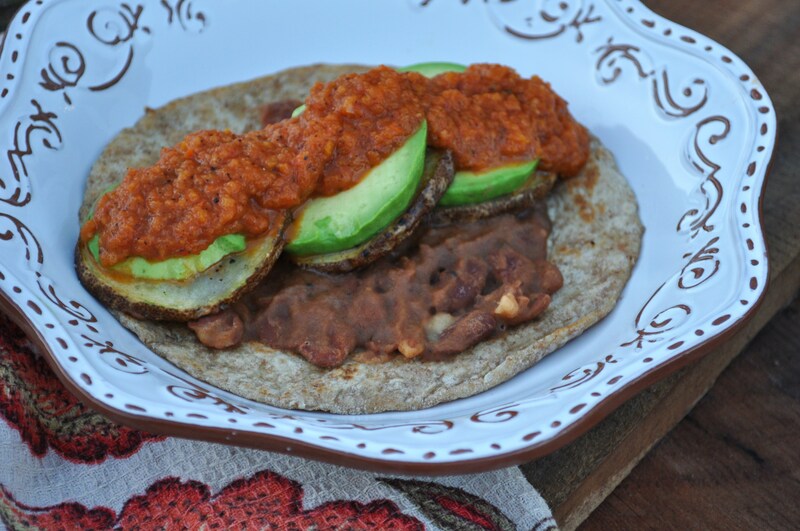 Working quickly to keep food from getting cold, put each tortilla on a plate, smear tortillas with refried beans, down the middle stagger stacks of a potato round topped with an avocado round. 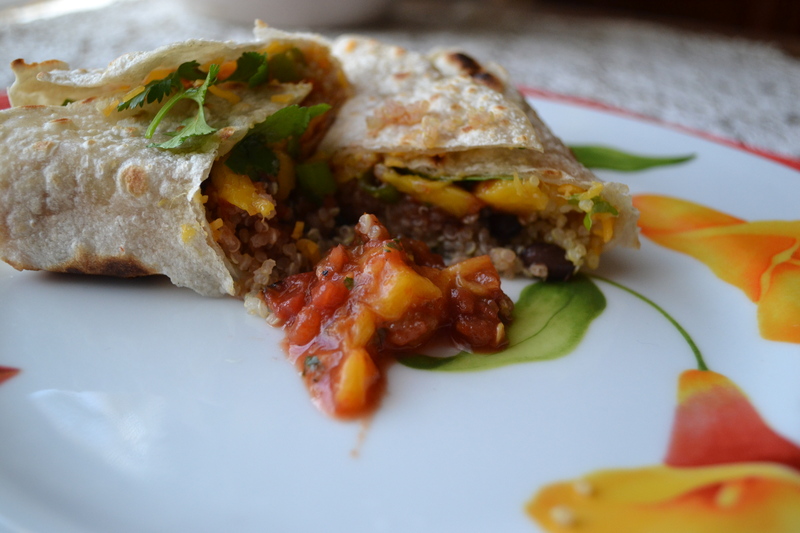 Top with warm ranchero sauce and optional garnish of cilantro and/or green onions. Serve immediately. 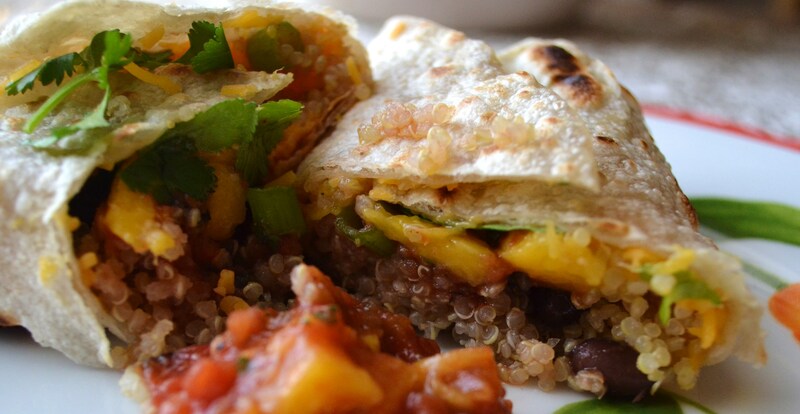 Eat with a fork or pick up and eat it like a taco. 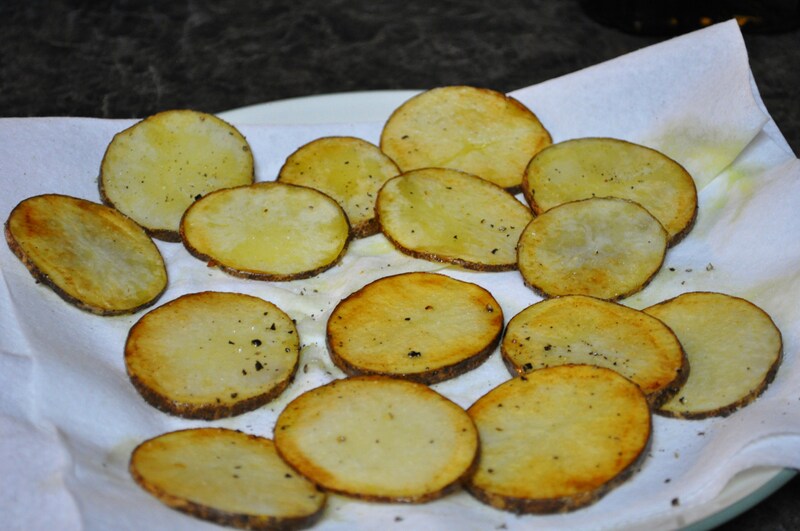 *For a lighter version, toss potatoes in a light coating of olive oil and salt & pepper, line them on a baking sheet sprayed with non-stick spray and cook under the broiler for about five minutes on each side or until cooked through (like these Blistery Balsamic Potato Chips). The short list of foods my husband Greg can cook are: hamburger patties, grilled cheese sandwiches and pancakes. So it may come as a surprise to you, as it did to me, that Greg is the one who taught me to poach a perfect egg. His mother taught him as boy, and he taught me as a newlywed, and I have to say that when I cooked one correctly: whites firm, yolk thick but still with plenty of liquid gold, it was something of a revelation. I’ve never been a fan of eggs. And I have no clue why poaching an egg in boiling water, rather than scrambling, boiling or frying (without benefit of bacon fat or butter!) transforms the lowly egg into something exquisite, but it does. To Julie Powell it tasted like cheese sauce; to me, with a tiny sprinkle of sea salt, a poached egg tastes like melted butter. 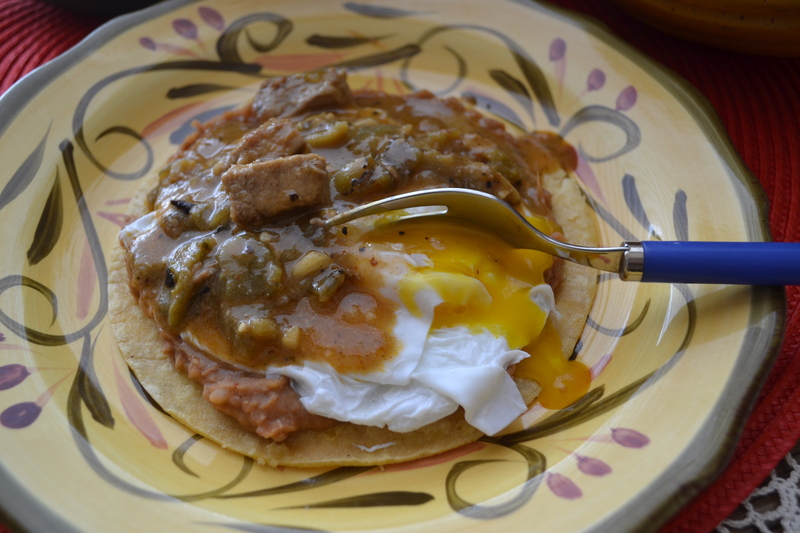 Last week I had a little left-over homemade green pork chili, along with some left-over homemade refried beans, and decided to make Huevos Rancheros. It was so good, hitting all the right flavor notes, I proceeded to have it every day for breakfast and lunch for the next three days. 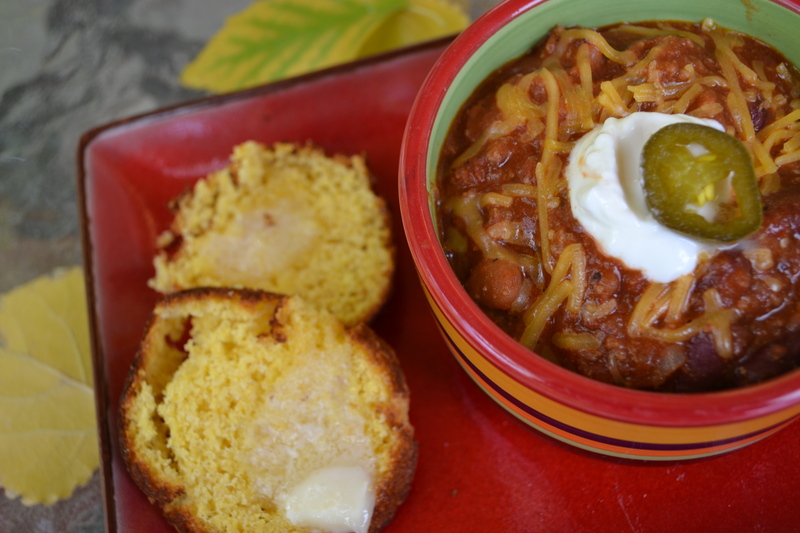 There was just something comforting and delicious about the combination of the flavors of warm corn, earthy beans and tangy green chilis topped with one perfect, buttery poached egg. Where had this dish been all my life? And why had I not made it before? Serves 1 or 2, depending on how hungry you are! Fill a small skillet 2/3 full with hot water. Add 2 t. white vinegar. Bring to boil. Carefully crack at egg into a small heat-proof bowl. Slip it carefully into the boiling water. Repeat with other egg. 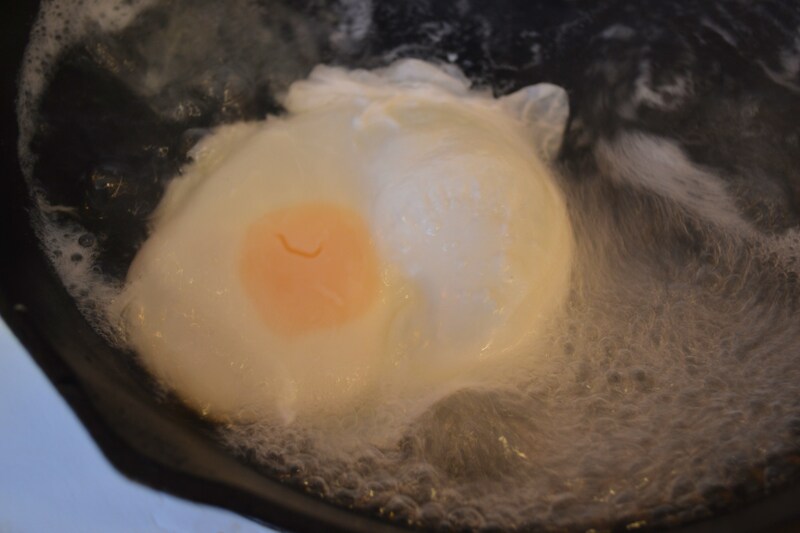 When you see the whites are firm and yolk is still soft and gooey, remove carefully with a slotted spoon and let drain on a couple of folded paper towels. Sprinkle them with a little sea salt and pepper while still hot. Wrap corn tortillas in a damp paper towel and microwave about 15 seconds until they are hot and soft. 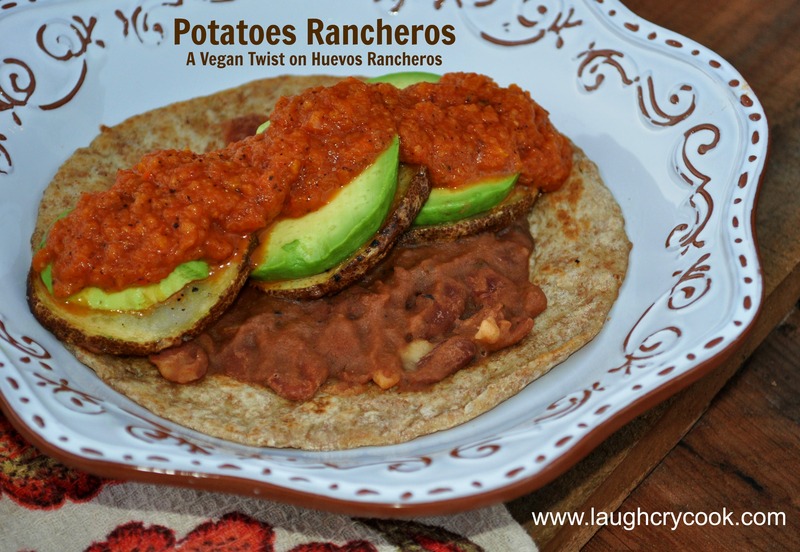 Immediately put them on a plate and put ¼ cup warm refried beans on each tortilla and spread just to edges. Next, carefully set a poached egg on top. Finally ladle all with ½ cup of warm green pork chili or salsa. Garnish with slice of fresh jalepano if desired. 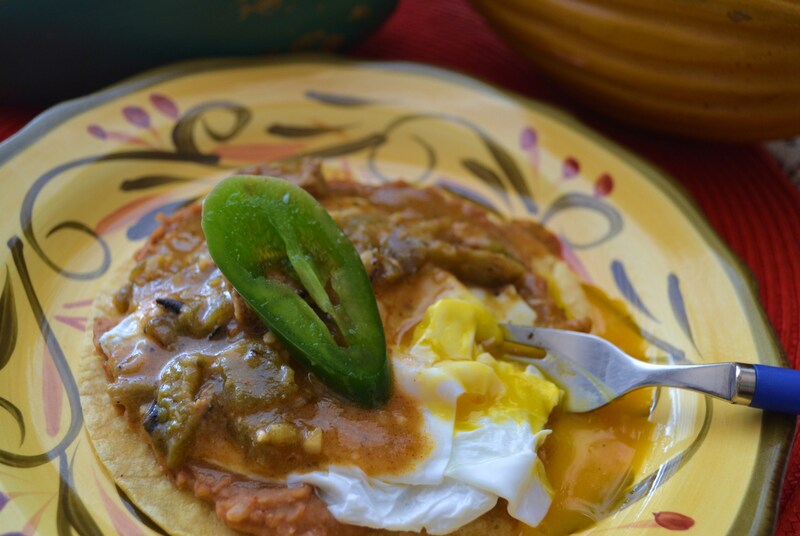 *You can find green chili of all varieties in the Hispanic food aisle of most grocery stores. I made my own quick green pork chili by blending 1 cup chicken broth with ¼ cup mild canned green chilis and 1 clove garlic in a blender. Then I mixed 1 1/2 T. flour with 1 T. olive oil and 2 t. butter until it made a smooth paste in a hot skillet. Then I slowly added the contents of the blender plus another cup chicken broth and ¼ cup more green chilis – whisking all the while until it was a desired thickness. (You can add more broth if needed. It should be the consistency of a good stew broth.) Finally I added about 2/3 cup of cubed leftover pork loin, a pinch of sugar (to balance tang of green chilis), then seasoned with salt and pepper to taste. You can use veggie or miso broth and omit the pork and make this a filling and delicious vegetarian meal. A childhood favorite, Mexican Salad, gets a facelift. When I was a kid, a staple quick dinner in our house was Mexican Salad. You know, chopped ice berg or romaine lettuce, Ranch Style Beans, tomatoes, shredded cheese, catalina dressing, all topped off with a bag of fritos. Adding fritos to lettuce is a sure fire way to get kids to eat their greens. This week I got invited to a Craft Night at a friend’s house. Let me just pause to say, wow. This working mom of two young kids hosts craft nights at her house every few months for 20-30 women. She gathers all the supplies, plans games and doorprizes, and even cooks dinner for everyone. People who handle this type of entertaining with ease simply amaze me. When I grow up, I want to be more like my friend Autumn. 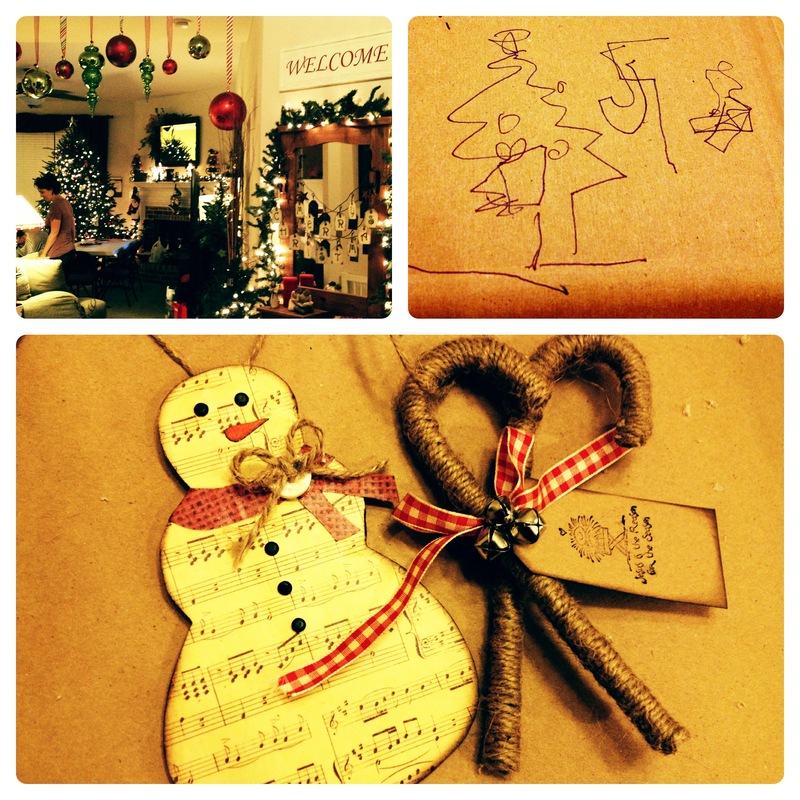 Festive decorations, silly games (I drew that picture on my head), and adorable crafty ornaments. The menu was a taco bar with requests for guests to bring a side or dessert. When I’m not sure there will be much for a vegan to eat, I like to bring a hearty side that will work as a main dish for me, but compliment the host’s meal and be a yummy side for others. 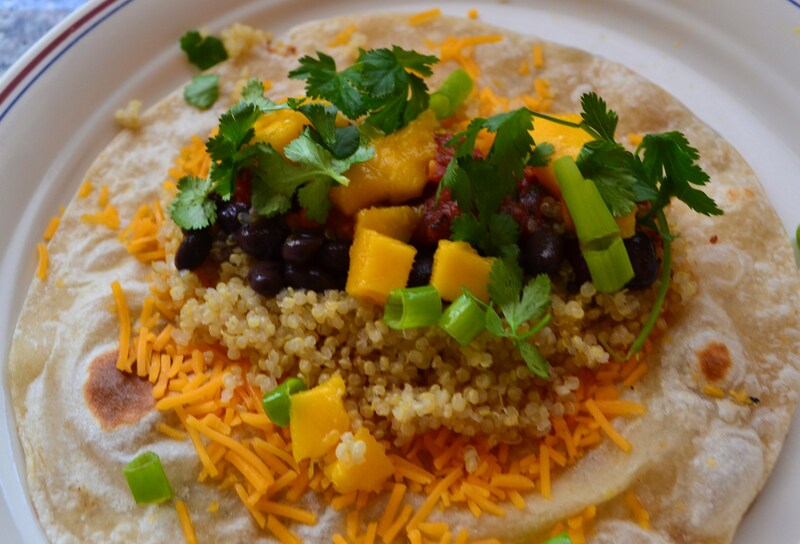 That childhood Mexican Salad popped into mind as a perfect compliment to a taco bar. I decided to give it a facelift though. The thought of bottled dressing, packaged fritos, and flavorless iceberg lettuce made me cringe a little. Instead, I made a homemade sweet and spicy catalina dresssing using honey and a chipotle pepper. Because I needed the dish to travel easily, I decided to use kale instead of romaine or ice berg. Kale can be dressed ahead of time without wilting, making it the perfect green for make-ahead salads. Plus it’s a beautiful deep green, adding color to the table and it packs a ton of nutrition, not my first priority for party food, but certainly a bonus. Instead of fritos, I fried tortilla strips and sprinkled them with chipotle powder, salt, and lime juice. 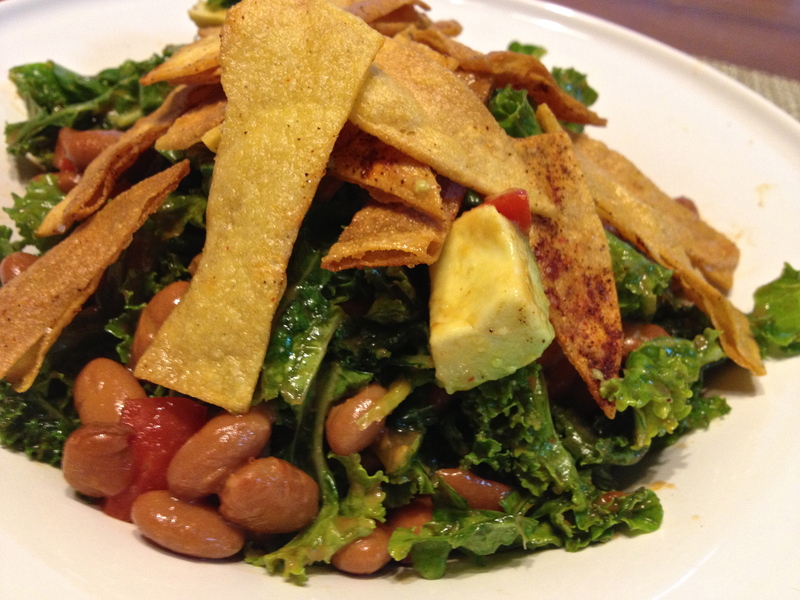 Covered in crispy fried chips, kale never looked so good! I loved loved this. A few guests found it to be a little on the spicy side, so if you don’t like spice, you can seed the chipotle and use paprika instead of chipotle powder on the chips. You’ll still get all the flavor without the heat. Delicious, filling, entree or side salad. In a blender, combine all the dressing ingredients. Blend until smooth. Sweet, tangy, spicy. 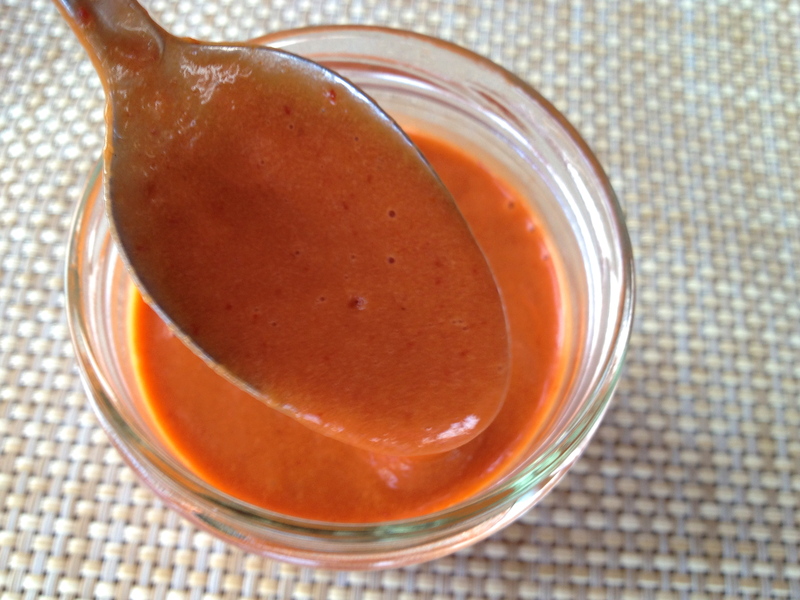 You’ll never want a bottle of boring Catalina dressing again! 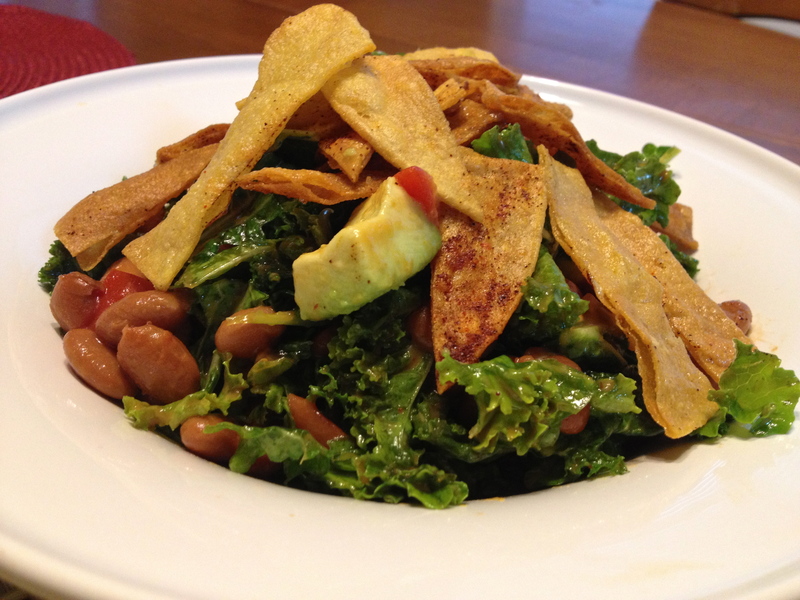 Put the kale in a large bowl and make sure the pieces are bite size. 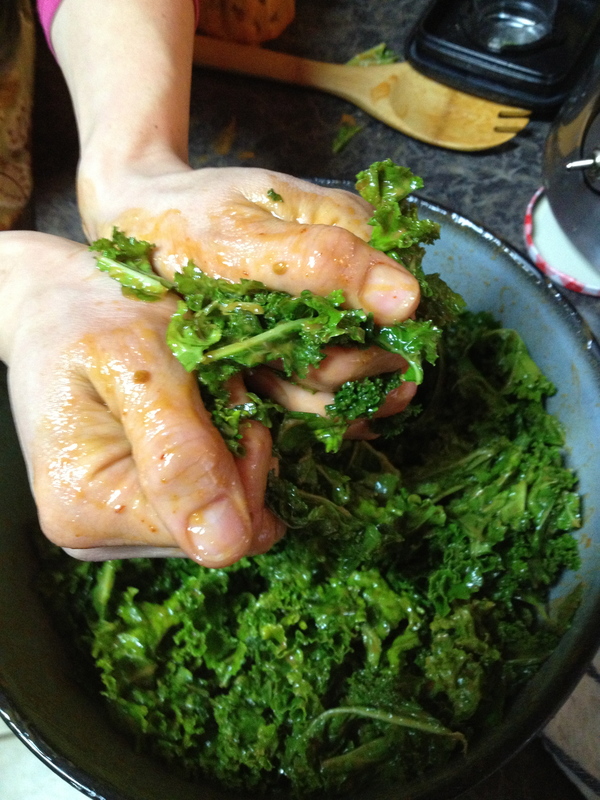 Pour in the dressing and use your hands to massage it into the kale. Get in there and really rub it in. You want to break the fibers of the kale down so it’s easier to chew. The secret to good kale salads is to massage the greens. In a heavy duty skillet, heat about 1/2 inch of canola oil on medium heat. When oil is ready it will sizzle when you drop a tortilla strip in. 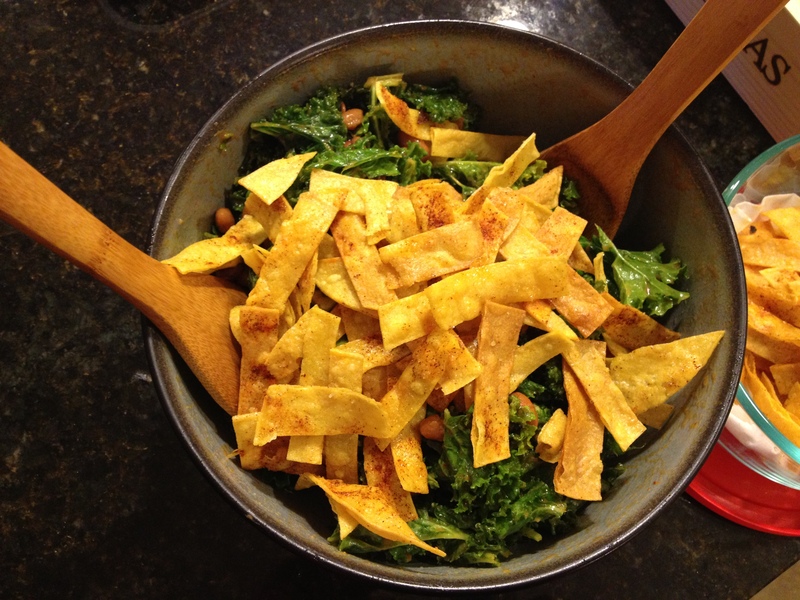 Drop in a handful of tortilla strips at a time, fry for 1-2 minutes until they are crispy. Set aside on a paper towel lined plate and sprinkle with just a little chipotle powder, salt, and lime juice. Repeat until all are cooked. Just before serving, add the fried tortilla strips. Easy to transport. Just bring the tortilla strips on the side and add them when you arrive at your destination. Sometimes the simplest things really are the best. I call this recipe Vacation Sopapillas because I usually have the ingredients lying around the condo or timeshare. If I were a person of the camping persuasion (which I am not), I would definitely be cooking these babies up around the campfire, using an iron skillet. 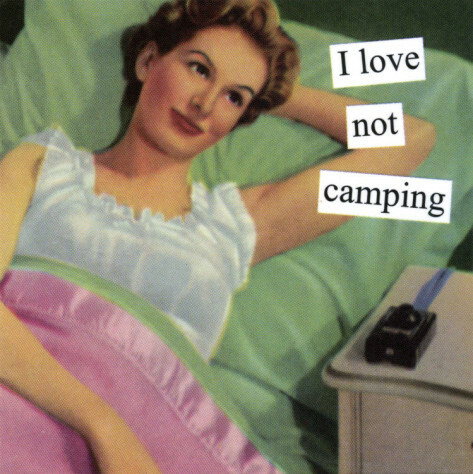 Hopefully, however, I’ll never be forced to do that. My husband bought me this greeting card, and truer words have never been spoken. I also call these my Vacation Sopapillas because they are so ridiculously addicting that I don’t allow myself this treat on a regular basis. So I try to only make them on vacation. Seriously, if you cook these… try to eat just one and let me know if it is humanly possible. This is a recipe you can throw together with minimum mess in a couple of minutes, just for little ol’ marvelous you. Since they are best eaten fast and warm, I don’t even try to serve these to a crowd. This a gift you give to yourself, and maybe, just maybe, one other person who you love very, very much. 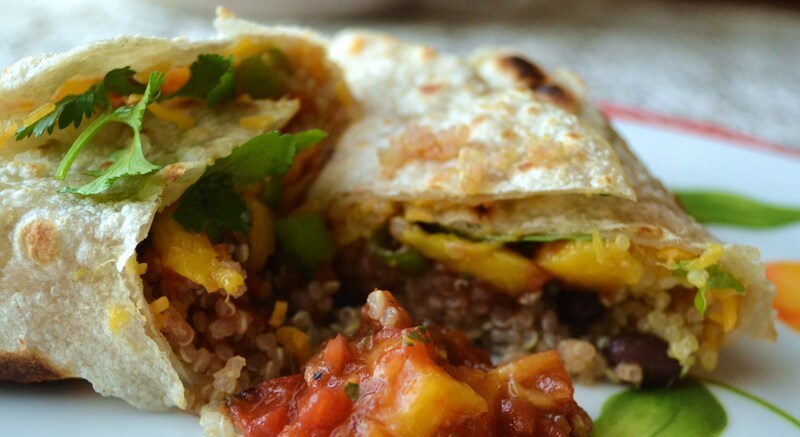 The trick is to use uncooked tortillas. If you’ve never tried them, boy, are you in for a treat. You’ll never go back the pre-cooked varieties again. 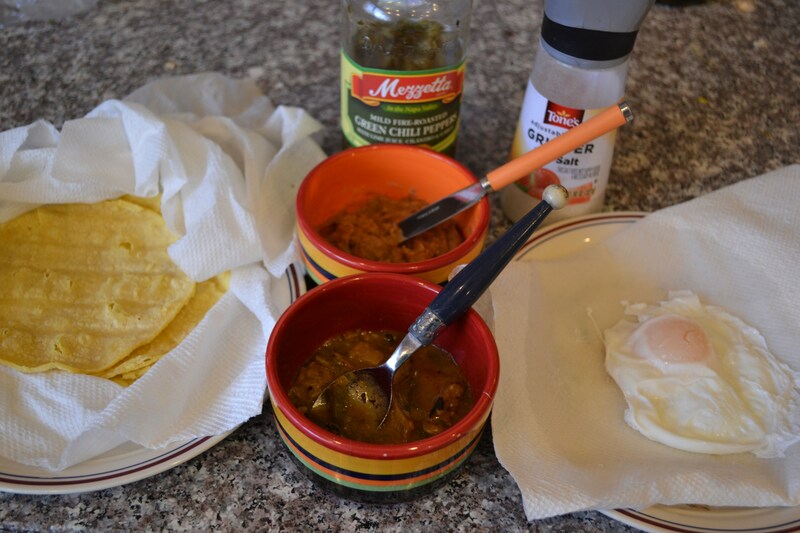 The brand I like best is called Tortilla Land (click link for $1.00 off coupon) and typically you find them in the refrigerator section of Costco and sometimes Sam’s or Wal-mart. 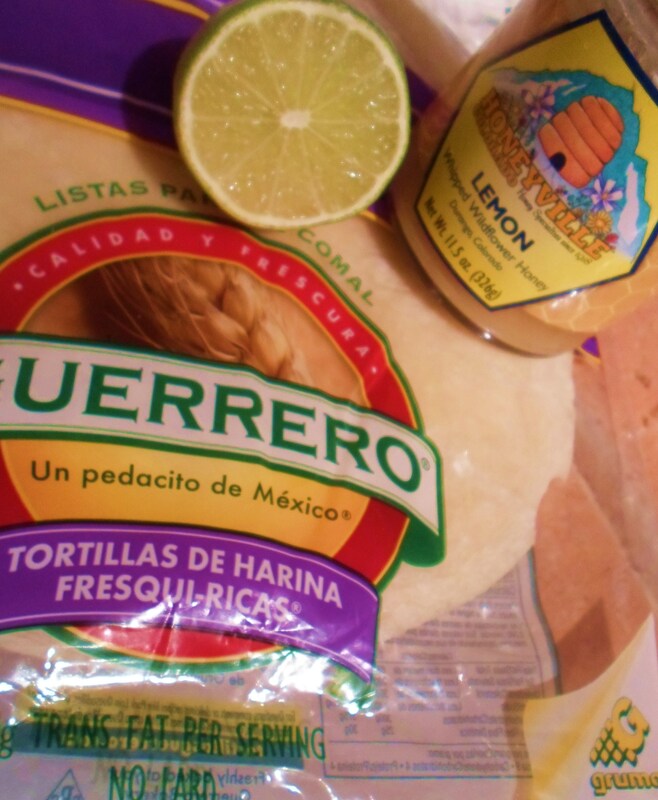 If I can’t find this brand of tortillas, however, it seems I can almost always find Guerrero brand (click on link for $1.00 coupon) which are soft semi-cooked tortillas, and they are not refrigerated. They just hang out on the shelves with the other regular tortillas in almost any major grocery store. Be sure to look for the yellow packaging (as pictured below); they should look very thin, not quite cooked all the way. 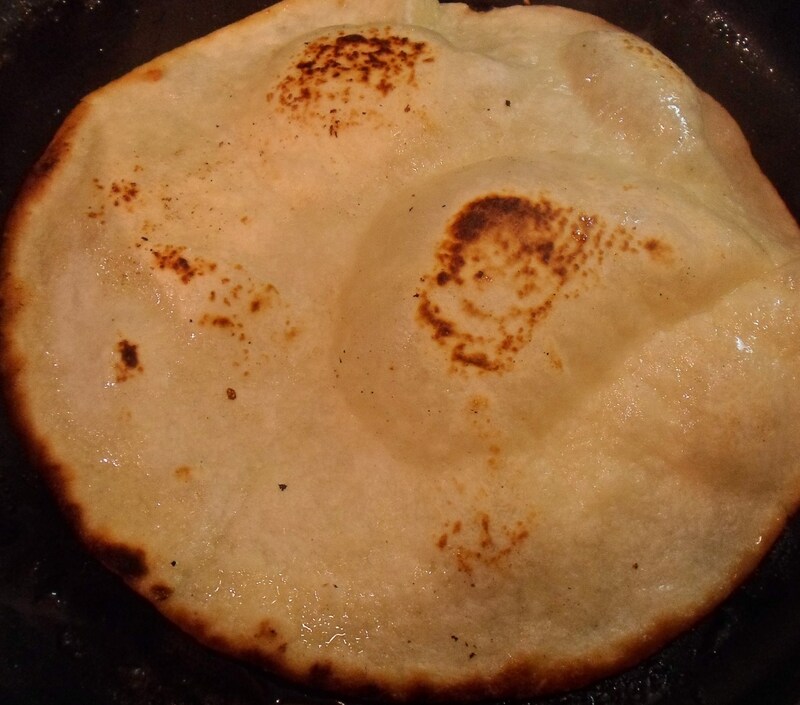 The beautiful thing that happens when these uncooked or semi-cooked tortillas hit a very hot skillet with a little olive oil/butter is that they puff up, very much like a big sopapilla. Only without all the work and the frying. My favorite version of these tortilla sopapillas is simple. After cooking I quickly slather it with a little butter, honey, a squeeze of lemon or lime, and light sprinkle of raw sugar. To eat it – you can tear it up in little pieces; roll it up enchilada style; or cut it in fourths, bending it in half, and eating it the way Italians eat flexible pizza. 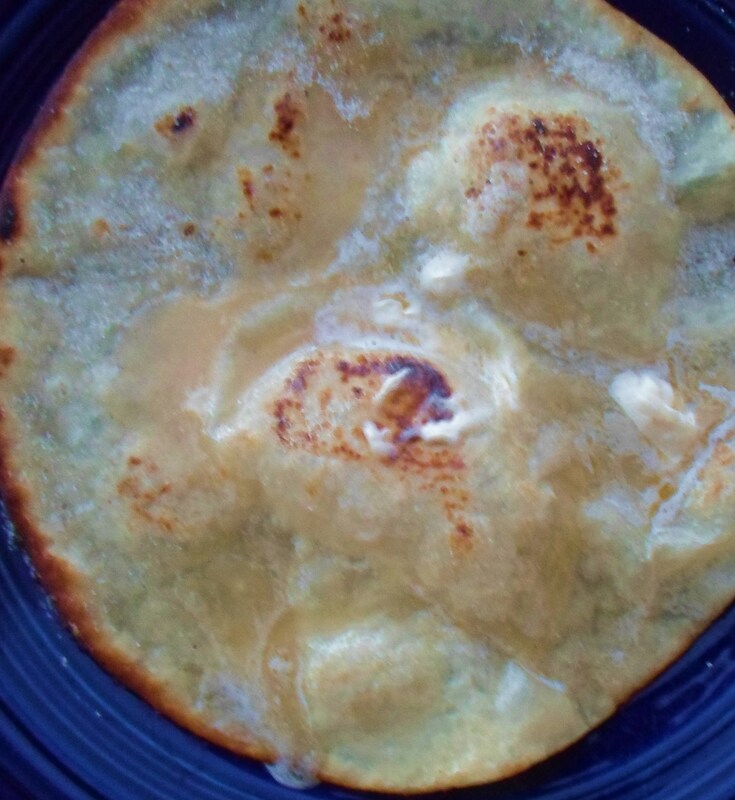 For variety, I also like filling the puffy tortillas with sliced bananas that have been gently cooked in a skillet with a little butter and brown sugar. 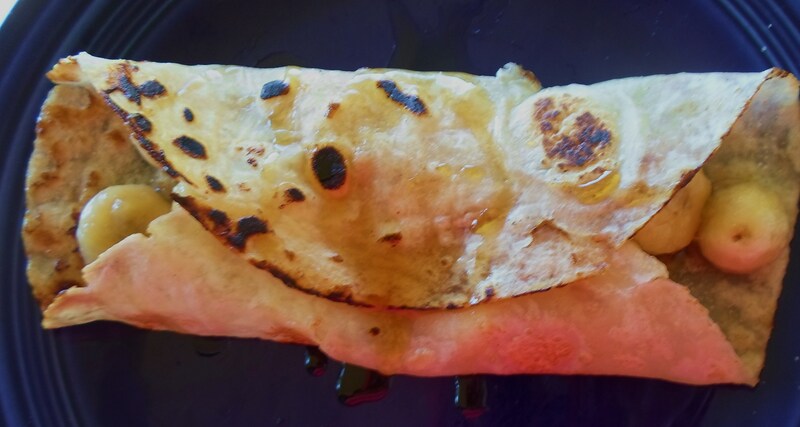 Then I roll it up like a burrito and drizzle with a bit of honey. Cooked apples with cinnamon and sugar make a fabulous filling as well. 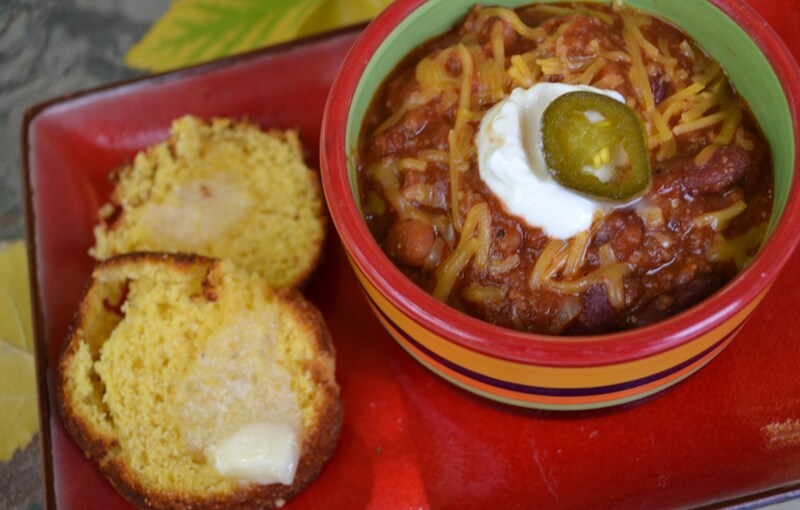 The only limits to this simple recipe is your imagination. 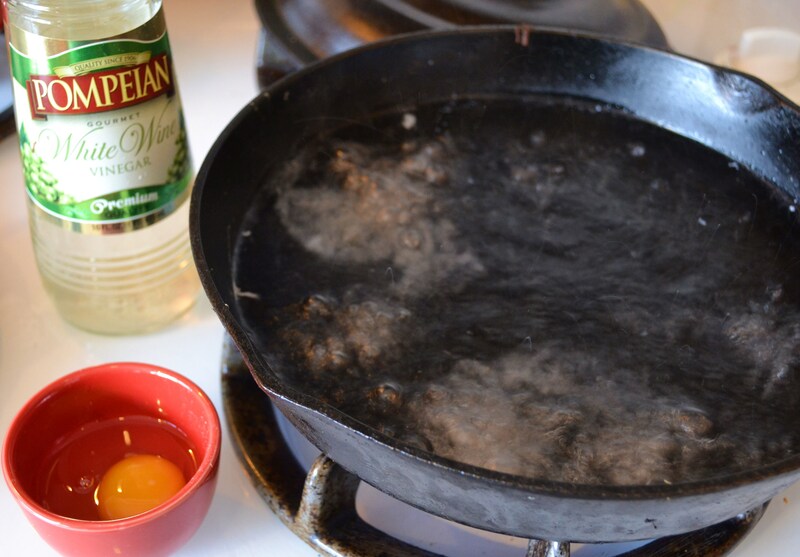 Put 1 t. olive oil and 1 t. soft butter in a hot skillet, and stir until blended. Put one uncooked tortilla in the pan. When it puffs up and browns on one side, flip it and brown the other side. 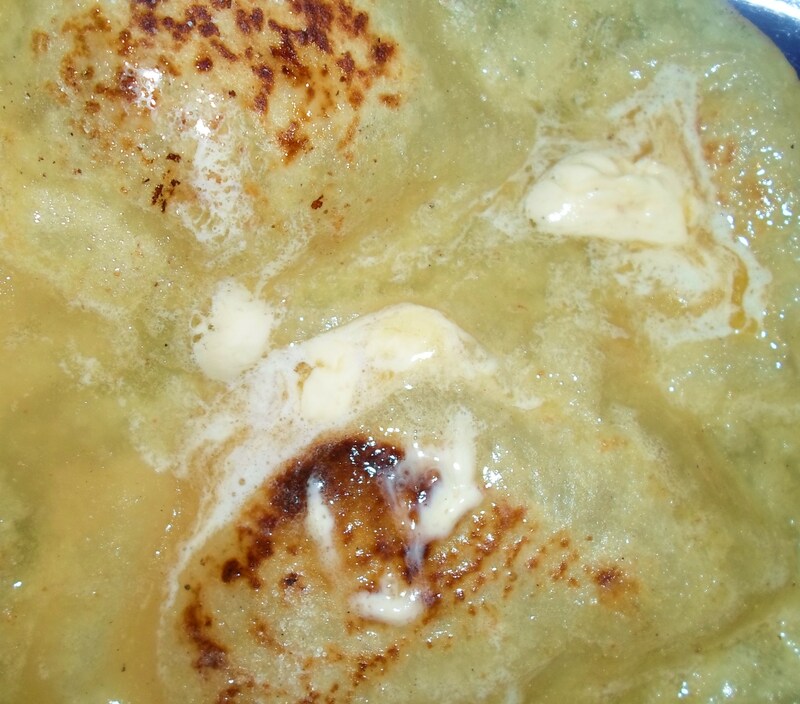 Immediately put tortilla-sopapilla on a plate, spread with butter, then honey, a quick squeeze of fresh lime and a sprinkle of raw sugar. 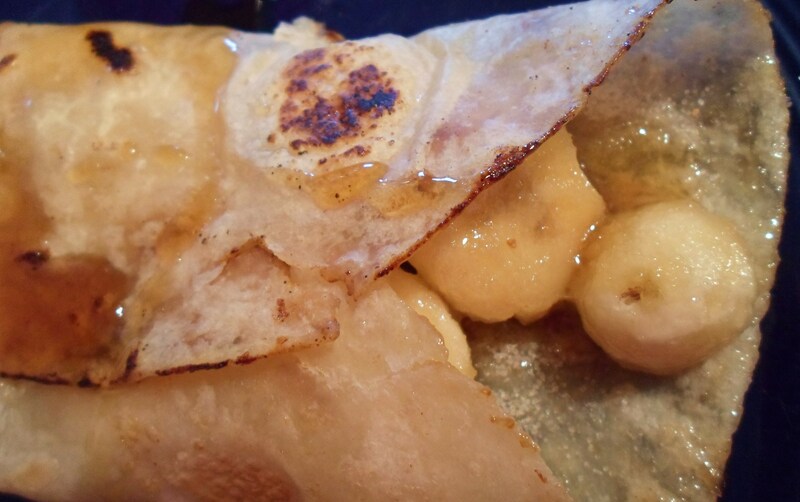 For banana sopapillas: slice one small banana and put in a skillet with a teaspoon of butter and a teaspoon of brown sugar. Stir just until bananas are warm and absorb butter and sugar. 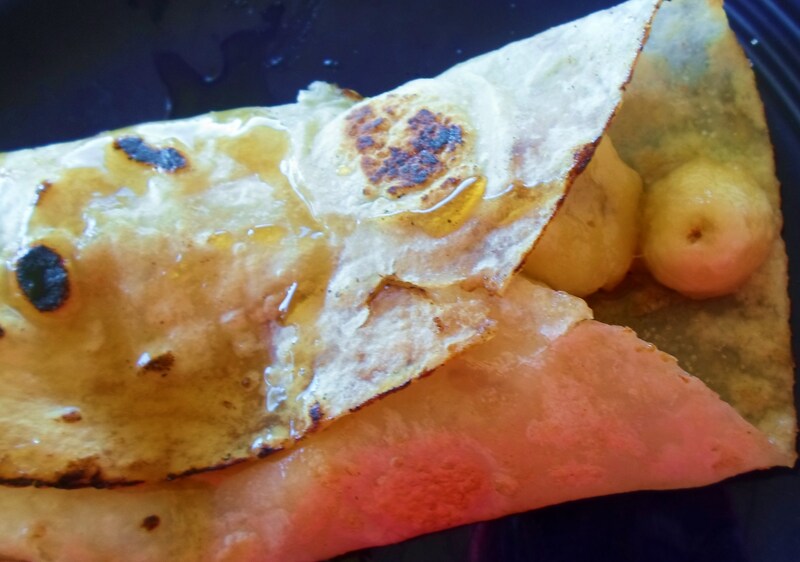 Proceed as above, only fill the tortilla with warm banana slices, roll like a burrito and serve with a little more honey. Eat with knife and fork. A dollop of ice cream and sprinkle of cinnamon couldn’t hurt either.